In 1999, James (‘Jim’) Oaks, found that there wasn’t any websites for 4-wheel drive & off-road Ford Ranger enthusiasts, so he decided to create a website to fill that void. At the time, site owners didn’t dare try to use a manufacturers name in their domain name. ‘An input or output point along a communications system’. It seemed like a good name for an online resource for Ford Ranger owners. The Ranger Station started as a homepage at gte.net, moved to xoom.com, then to geocities.com, and then to homestead.com. While at homestead.com, the site got a subdomain of www.therangerstation.cjb.net. If you go to the internet archives at archive.org and type in that address, you get the results found HERE. Archive.org first archived The Ranger Station in October of 1999. In the beginning, the sites slogan was “For The Ultimate Off-Road Ranger”. In 2001 the sites slogan changed to “The Ultimate Ranger Resource” so that it didn’t exclude those building custom street trucks. In August 2002, a secondary slogan of “Because real trucks are built….not bought!” was added. In August 2004, the secondary “because real trucks are built….not bought” slogan was dropped, and “Serving Ranger, Bronco II, Explorer and Mazda B-Series Enthusiasts” was added. Also in August 2004, the main slogan was updated to “The ‘Original’ Ultimate Ranger Resource” because another Ranger site had taken our slogan. The Ranger Station TRS logo was first introduced at the beginning of 2002. Realizing that The Ranger Station was here to stay, Jim registered the domain name www.therangerstation.com in 2000, and had it redirected to the site at homestead.com. The site was moved to a regular server later that year. In the fall of 2001, The Ranger Station was moved to another server where it remained until the start of 2004. The site stayed there until it outgrew the hosting company, and moved from a shared server to a new Virtual Private Server (VPS) in 2007. In 2008 the site was moved to a new VPS, and finally ended up on its new Cloud Server in 2018. The Ranger Station began using YaBB forums in 2001, but as the forums got larger, they also got slower. Over the years, The Ranger Station has used phpBB, Invision Power Board (IPB), and vBulletin forums. The initial use of vBulletin was done using software owned by the hosting company. In 2007, The Ranger Station switched to a new server, and purchased its own vBulletin software. The old hosting company wouldn’t let The Ranger Station have the forum database, so it had to start over with an empty forum. This meant that all of the forum posts and members prior to 08/2007 were lost. The Ranger Station hosted regular trail rides up until 2007. The first trail ride was held in Wellsville Ohio in 1999. The Ranger Station has been fortunate enough to have a couple of trail rides featured in ‘Offroad Adventures Magazine’, and some of the trail rides had corporate sponsors. When the economy nose-dived in 2007, buying truck parts and travelling long distances for trail rides became an expense that many had to skip. The Ranger Station hosted its last official trail ride in 2013, but a 20th Anniversary trail is being scheduled for 2019. FX4 – Being a large website with active forums, The Ranger Station gets manufacturers that browse through to see what the consumers (you) have to say about your vehicle and the products you use. Jim Oaks actually had discussions with a Ford engineer about some future changes to the Ranger, and the not then released FX4 Ranger. He didn’t have any direct input in to the design, just offered feedback to the ‘what if’s’ and told the engineers what some of the typical upgrades were that enthusiasts were doing. On September 7, 2001, Jim and a few forum members actually got to drive the prototype FX4 and see it in action during a trail ride in Wellsville Ohio. The engineer he was communicating with brought it to the trail ride. This was well before the FX4 ever hit the dealerships. You can see more about that event HERE. Stickers A No-No – As The Ranger Station grew, the cost to host it increased. Jim Oaks offset that cost by selling vinyl stickers. A few of those stickers had the Ford Logo on them. In 2008, The Ranger Station came under attack by Ford. Actually it was a law firm representing Ford that was demanding The Ranger Station’s URL, and $5,000 in damages. They also wanted to know how many decals had been sold. The law firm claimed that The Ranger station didn’t have a license to sell items with the Ford logo, and couldn’t use photos on the website of Ford products. Jim asked The Ranger Station forum members to send an email to Ford, and asked them to reconsider. The situation went viral quickly, and was quickly extinguished by Ford’s Social Media Strategists Scott Monty. Scott Monty and Jim Oaks discussed how the situation came to be, and Mr. Monty was able to work out a resolution between Jim and Ford. While Jim did have an account with Ford media to access the photos, he didn’t have a license to sell anything with the Ford logo. The URL was pretty much a mute point since Ford doesn’t own exclusive rights to the name ‘Ranger’. Jim agreed to not sell any more stickers that had the Ford logo on them, unless they were licensed. This event actually made the Wall Street Journal, and was later written as a social media guide for business executives. A pdf example of it can be found HERE. 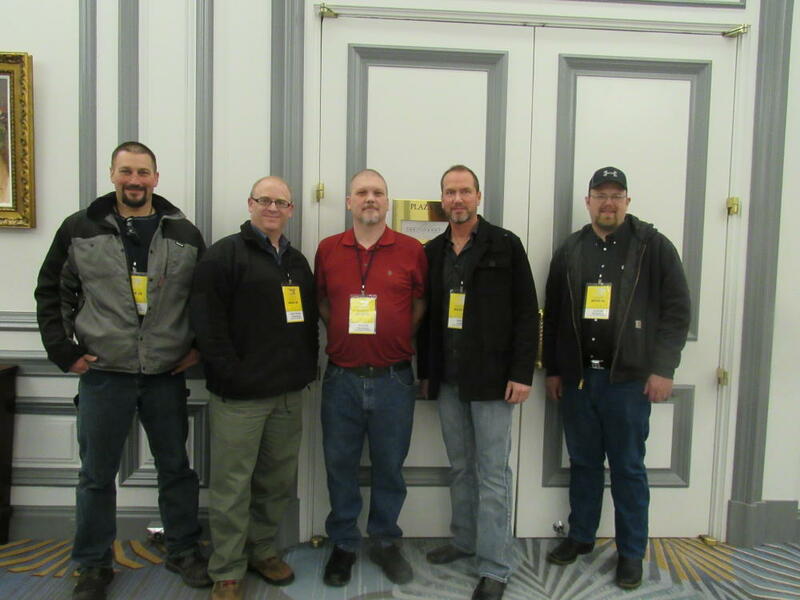 The Return of The 2019 Ford Ranger – On January 14, 2018, Jim Oaks and The Ranger Station forum staff members Bobby Walter III (bobbywalter), Caleb Johnson (fastpakr), Anson J. Nichols (97RangerXLT), and Justin Russell (85_Ranger4x4) traveled to Detroit Michigan at the invitation of Ford to witness the debut of the all new 2019 Ford Ranger. Ford paid for the airfare, accommodations at The Henry hotel, as well as food, transportation and access to the North American International Auto Show (NAIAS). All were grateful that Ford allowed them to take part in the event. In July of 2000, 4×4 Power magazine did an article entitled ‘4×4 Blueprinting – ’83-’97 Ford Ranger’. It was a tech article written by Jim Allen. The Ranger Station was listed in the article as a resource, and there was a special thanks to Jim Oaks at The Ranger Station for providing information. 4X4 Power is no longer in print. It was a sister magazine to 4Wheel & Offroad magazine, and published by the same company. The Ranger Station’s spring 2003 trail ride (Spring Ranger Round-Up) was featured in the pages of Off-Road Adventures Magazine in the October/November issue. The story was called ‘Return To Wellsville’. Jim Allen took a photo of Brett Beach’s 2000 Ranger which later appeared in magazines as Randy’s Ring & Pinion/Detroit Locker ads. Jim Oaks’ TRS-1 Ranger was featured in the December 2003 issue of Off-Road Adventures Magazine. The story is called ‘Practical Ranger’. Off-Road Adventures Magazine covered The Ranger Station’s 2004 Snowball run and printed it in the January 2005 issue under the title ‘Mudsicle’. In 2004, Jim Oaks built a 1996 Ranger that Off-Road Adventures Magazine covered in a 6-part series in 2005 entitled ‘Transformer’. The truck was built with the help of several sponsors, and the articles have been captured HERE. On March 13, 2010, TheRangerStation.com was mentioned on Power Blocks “Trucks” TV show. Trucks TV was starting a Ford Ranger (Mazda B-Series) build. A social media guide for executives has been published titled “The Ranger Station Fire“, and uses the 2009 social media crisis between us and Ford as its source. Also, The Ranger Station has been mentioned numerous times in various magazines by enthusiasts writing in. Jim no longer has the 1983 Ford Ranger (TRS-1), and the 1996 Ford Ranger (TRS-2). For more information on the 1983 Ford Ranger, click HERE. For more information on the 1996 Ford Ranger, click HERE. Their color scheme was introduced around 1993, and was inspired by the Ford Rough Rider off-road racing team that dominated desert racing in the early 1990’s. A replacement Ford Ranger is being planned for The Ranger Station’s 20th Anniversary. The Ranger Station is owned and operated by 959 Media LLC. 959 Media LLC is owned and operated by James Oaks. While the site was initially created by James Oaks as a personal website to help other Ranger enthusiasts, he eventually established a Limited Liability Company to allow personal liability protection. The Ranger Station is one of the few websites created in the 1990’s that is still owned by its creator, and has not been sold to large media corporations. The Ranger Station forums are moderated/administered by a group of volunteer staff members. A current list of staff members can be found HERE. Additionally many of the articles submitted to the site are submitted by site members and online Ranger enthusiasts.